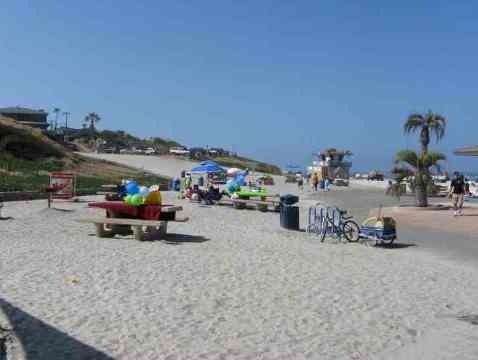 One of the locals favorites, Moonlight Beach Encinitas is the most popular Encinitas beach, great for families and teenagers. Moonlight beach hosts many popular events and programs, including the annual summer beach concert series and the classic "Woodies" car show in September. Local youths enjoy the Junior Life Guards program. These events are listed on our San Diego event pages. 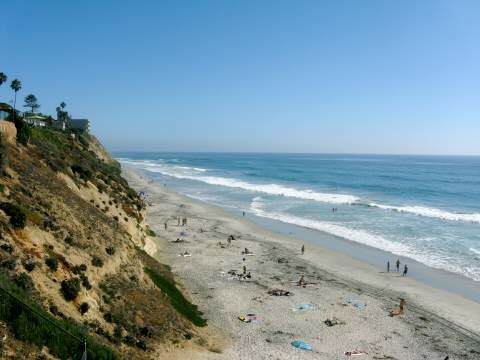 A visit to Moonlight Beach should include a visit to downtown Encinitas, just a few blocks away. You can stroll along and enjoy the many shops and restaurants in a charming beach community. Moonlight Beach in Encinitas is the local teenager hangout with all the essentials - boys, girls, beach volleyball, snack bar, nearby pizza and nightly bonfires at the beach firepits. A short walk will get you to downtown historic Encinitas, a charming surfing town. You will find surfers along the entire 6 miles of coast of Encinitas California beaches, which includes the Leucadia beaches and Cardiff beaches. This is one of my favorite San Diego beaches in north county. 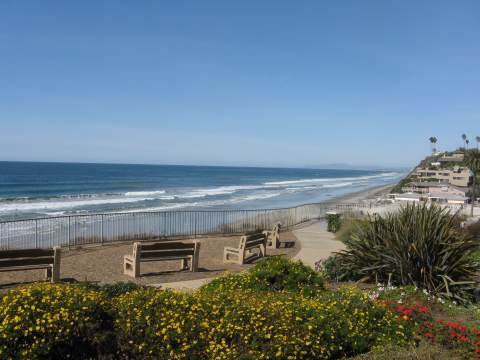 The beach is just the right size, has plenty of free parking and is right near the charming downtown Encinitas district. Everyone loves Moonlight beach! Nearby attractions include the San Diego Botanic Garden, Swami's beach and the meditation gardens at the Self-Realization Fellowship temple. Location: Pacific Ocean at the end of Encinitas Blvd, in Encinitas, Cal. Parking: Free parking one block from ocean between B and C streets. Also free street parking available. Things to Do: Walking, jogging, beach volleyball, boy and girl watching, sunbathing, swimming, bodyboarding, surfing, beach fires in firepits, walk south to Swamis or north to Stonesteps Beach or Beacons Beach at low to moderate tides. Services: Snack bar in summer, many restaurants, bars, surf shops, rental shops along historic 101 just a few blocks away. Best Restaurants:There are so many to choose from it is hard to name a favorite. If pizza is on your mind, try Leucadia Pizza. For an interesting hot buffet or salad buffet, try Lazy Acres market. For breakfast, try the Potato Shack Cafe. For lunch or happy hour, try the Bier Garden of Encinitas. For tacos, try The Taco Stand. For some great Hawaiian, try some poke at The Lanai, a hole-in-the wall just north in Leucadia. Encinitas has a fantastic beach town culture, and is worth a visit to the historic 101 strip of Bohemian style shops and restaurants. Just south of Moonlight Beach is D Street beach access point. Boneyards beach runs from D Street south to Swami’s point, a famous surfing spot. Just south of Swami’s in Encinitas, California is Pipes, a nice surfing break, and beyond that, San Elijo State Beach campground, a very popular San Diego beach camping spot, followed by Cardiff Reef on the south end of the campground where the cliffs end. Cardiff State Beach at the southern end of Cardiff is best known for its restaurant row along the beach (and allows leashed dogs on the beach). Going north from Moonlight is Beacons Beach, formally called Leucadia State Beach, a long narrow beach that runs for about 3 miles from popular and crowded Moonlight State Beach to the south and South Carlsbad State Beach to the north. Along the way you will encounter Stonesteps Beach, a beach access. If Moonlight beach is too crowded for your liking, just head north or south and the beach gets quieter. You can walk all the way south to Swami's and beyond at low tide, and north to Carlsbad Tamarack Beach at low tides. Moonlight Beach Encinitas CA Driving Directions - From Interstate 5 in Encinitas, take Encinitas Blvd. west to the Pacific Ocean. There is a large free parking lot between B and C street just one block from the ocean. 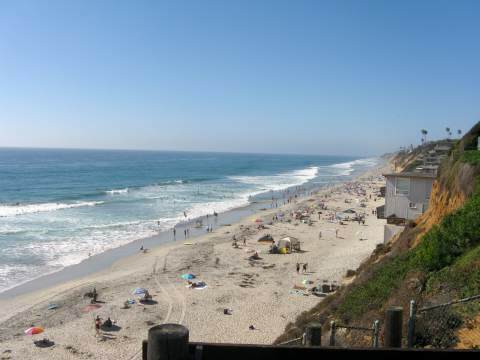 By Train - You can easily reach Encinitas Beaches (Moonlight Beach) from the San Diego Coaster Train. It is 3 blocks from the Encinitas train station. Note: The Coaster trains have limited service on Saturday, Sunday and holidays, currently running only 4 trains a day. Be sure to check the current schedule for train service.